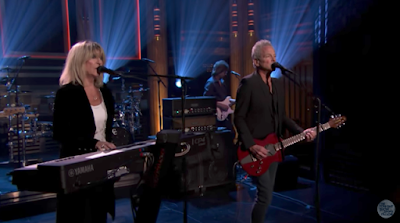 Fleetwood Mac members Lindsey Buckingham and Christine McVie performed their single, “In My World”, on The Tonight Show starring Jimmy Fallon on June 8 and video from the program is available online. The tune was the lead track from the pair’s just-released self-titled debut album, the idea for which came together when McVie reunited with the band for dates on their On With The Show tour in 2014. Buckingham McVie will perform the new material during a series of summer dates across North America, starting in Atlanta, GA on June 21.